That's neat! Right down to the shadowing. Beautiful fall creation from a creative mind! It's a question of time before the leaves turn (already way up here in the north) and a question of time before they fall. It's a question of time as we see the light penetrating the darkness later and later. It's a question of time as the darkness encompasses the light earlier in the evening. It's a question of time before I will go to work in the dark and come home from work in the dark. 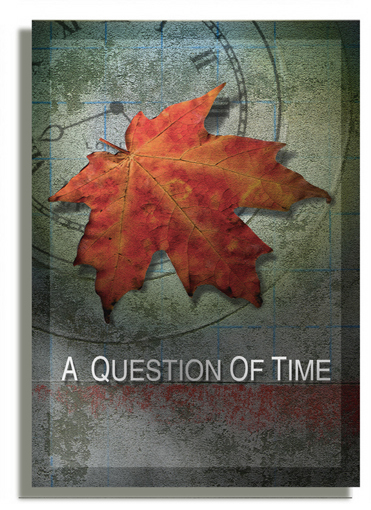 It's a questions of time before we reset our clocks and a question of time of which way we turn them. Those are the obvious things, if we want to get into symbolism and allegory there are hundreds more. All, in all, a beautiful and thoughtful and timely piece. Thanks for the encouraging word. It's starting to feel nippy here in Decatur. I thought a nicely done "Welcome" was in order. The background surface makes me pine for another turpentine "faux aged" piece. I'd also like to see the technique used in a "modern/romantic/impressionist" fusion piece. Nipply in Decatur...Evergreen is having a very warm fall. Maybe you should come back here for awhile 86 degrees today (in DEN). Playing golf at Fox Hollow. Ya don't appreciate the changing of the seasons until ya live in 'sunny Southern California'. Yeah, it gets dark earlier, and rains more often. But other that that ya have to go to the mountains to actually see "fall". This page contains a single entry from the blog posted on September 30, 2011 6:39 PM.